Are dads on the go? It reminds us of the world he rightfully bemoans, where changing stations remain plentiful in women’s restrooms, yet not in men’s. Mirroring this is the myopic American Baby magazine again pushing the dads-don’t-parent envelope, making fathers to be the second class parental unit through an advertising page that suggests dads don’t buy baby products. We’ve said it before, and we’ll say it again: American Baby magazine should consider a name change if it’s going to continue the practice of deliberately avoiding its dad readership. The chain reaction of support Kutcher received from his Facebook post, including from state legislators, validate what we’ve been saying all along: dads care. The days of hands-off fathers who watch mothers raise children are ancient history. That was generations ago. Today, dads have never been more active, and more vocal – and they shop, too. Just ask Ashton Kutcher. 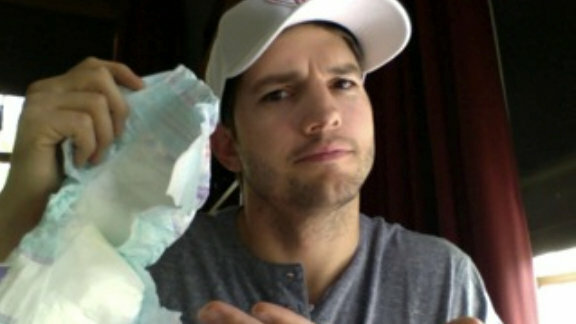 If American Baby magazine doesn’t start altering its ways and incorporating more dads in its magazine, it would only take only one tweet from @aplusk to let his 16 million followers know just how he feels. They say ‘good things come to those who wait,’ but it’s likely Ashton Kutcher never listened. Upon leaving the University of Iowa in 1996, Kutcher rose to meteoric fame by immediately modeling, and then landing on Fox’s long-running “That ‘70s Show” by 1998, where he gained his instant stardom. And his acting accomplishments may seem like nothing compared to his prowess on social media, particularly Twitter, where he became the first user to reach one million followers in 2009. Yet as he reaches a nearly 20 years of work in Hollywood, Kutcher is taking on his biggest role yet: dadvocate. Last October, he and Mila Kunis gave birth to daughter Wyatt, and just a few months later, Kutcher had become victim to dad exclusion like so many fathers before him. So, this past March, Kutcher complained about the lack of pubic diaper changing stations on his Facebook page, a post that went viral and caught the attention of a New York state senator, Brad Hoylman (D-Manhattan). Hoylman’s proposed an amendment would change the New York Civil Rights Act and require many newly constructed or renovated public buildings to provide diaper-changing rooms in men’s rooms where they are also present in women’s rooms. Kutcher, meanwhile, launched a change.org petition intended to have Target and Costco offer changing stations to both moms and dads in their stores. How this plays out remains to be seen, but for now, both Kutcher and Hoylman should be enthusiastically lauded for their efforts. With all due respect to our lawmakers and government, Kutcher, in particular, carries a lot of weight and power, and he may be a key figure in putting dads on a rightful equal ground. However, real change isn’t going to happen in a restroom, it’s going to happen when perception shifts – and that can only occur when principal influences begin to treat dads like they count as much as moms when it comes to parenting. Those influences are in the marketing and advertising of the products and services we use, in the media which shapes our attitudes, and in how Hollywood portrays the dad character. As long as Jif Peanut Butter trumps its one-sided marketing slogan, and Kix cereal speaks only to moms, and American Baby magazine employs old fashioned writing that ignores fathers, and writers slap unfair and embarrassing stereotypes on dads which only apply to a minority – and thus we keep reading, and buying and using these products – diaper changing stations for dads will be merely pacifistic tools demanded by law. And only fathers would see the change anyway; indeed, it would be a welcoming and needed change in law, but only dads would benefit and see the restroom modification. Instead, if Kutcher could really get to the heart of the matter, and use his influence to encourage others to include dads in positive ways through marketing, media and entertainment, the “#1 Dad” mug he receives from his daughter on his first Father’s Day this June will be more valuable than any acting honor he’s ever accepted. And letting everyone see it would make for the best tweet ever. 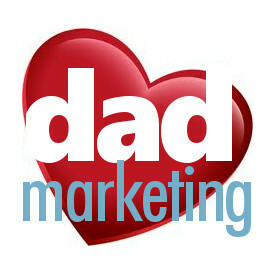 You’ll find no knee-jerk reaction to marketing campaigns we encounter before posting them at dadmarketing.com. 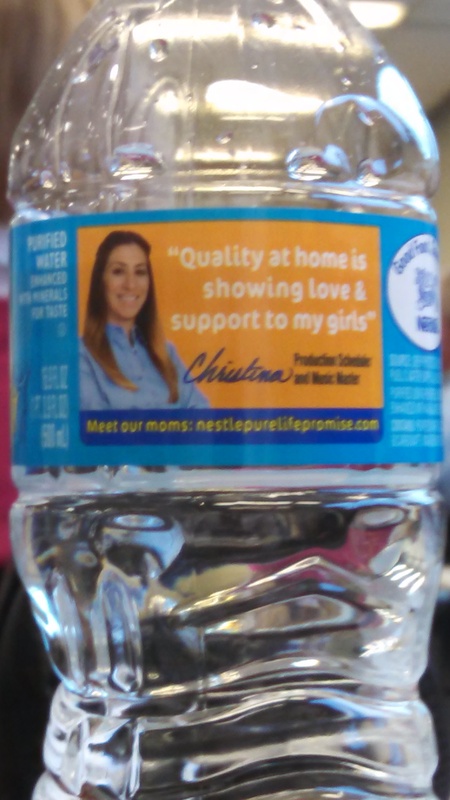 When we saw the new “Nestle Pure Life Promise” campaign on the side of a water bottle which exclaims, “Meet our moms,” it might be easy to jump to conclusions. At first glance it looked like another company proclaiming “mom” as the family decision-maker, purchaser and overall food/drink provider. At second glance, and looking deeper at its website, Nestle is trying to use employees who happen to be parents, while proclaiming that their roles as moms and employees are virtually intertwined. After watching the mom videos, however, that’s when we started to notice some onesidedness at the expense of dads. So here we have a quote that once again purports the stereotype that mom is the one who shops, makes the food decisions, and gives out the love. Of course, it’s entirely plausible that Teneisha is a single mom, thus, the only provider for her home. But assuming that is missing the point. Instead, here we see yet another campaign which only focuses on the moms, and it continues to perpetuate the unfortunate stereotype that dads are only the monetary providers at best, and hardly the providers of food, meals, or even love. It’s disappointing to see Nestle Pure Life’s misfire with this campaign. When it comes to bottled water, thanks anyway Nestle Pure Life, but we’ll drink something else. Johnson & Johnson, makers of Desitin, is at it again. It puts dads in a box, seeing dads as the way it has always seen them, no matter how much times have changed. 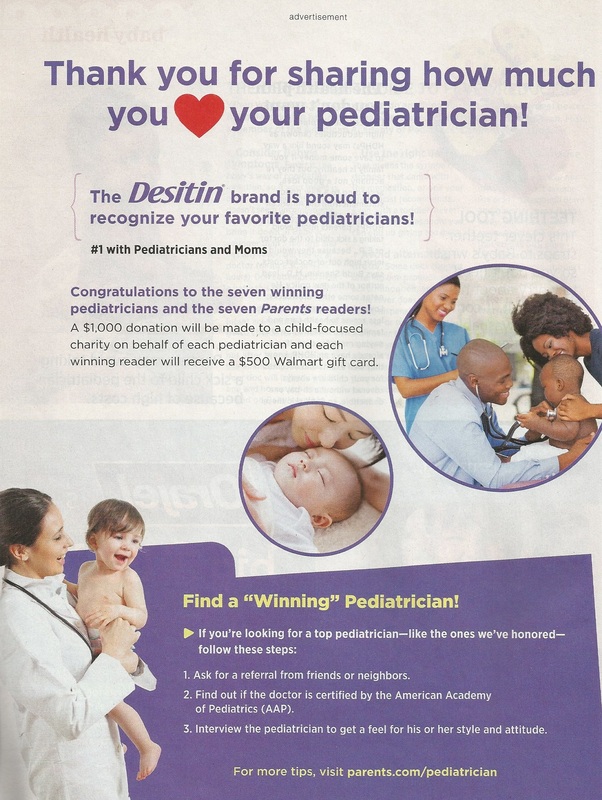 You’ll find its latest ad and subsequent slogan, #1 with Pediatricians and Moms, is repeated twice on its latest two-page spread, featured where else but American Baby magazine, as well as highly visible at the top of its website — with its own separate “seal of approval” logo to boot. Completely nonexistent, from the print ad and all the way through every single web page at desitin.com. Even though J&J/Desitin totally ignores dads, I still find it slightly odd that – through applying the troubling “dads don’t know how to handle babies” approach – it wouldn’t even seize that as an opportunity to highlight at least one dad on its website. 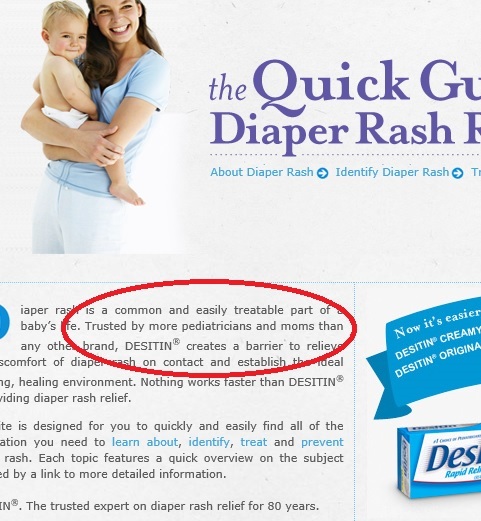 After all, with menu tabs like, “What is Diaper Rash?” and “Identifying Diaper Rash,” and having an only-moms-care-for-kids approach combined with a boxed-in, close-minded attitude toward fathers, you’d think Desitin would take the opportunity to feature that other, less involved “assistant” parent – you know, dads. We offered a review of a similar Desitin ad 9 months ago, and now here we are today, and it’s the same problem. Isn’t that how some define insanity: continuing to do the same thing but expecting to get different results? Good marketers can let go of the past and move on to a new future, growing the brand and branching out into other market segments. Look at this past Super Bowl to see how much big-time marketing departments value fathers. But doing the same thing over again results in a stagnant approach. It may not translate directly into sagging sales today, but over time, and generations, it’s a surefire way to kill a brand. Is J&J/Desitin up to the task? But if it is, I suspect like diaper cream, it would see instant results. A trip to the library is a lot like driving on a long-distance vacation. It’s fun and fascinating, and whether you’re looking for a particular book or just browsing for whatever meets the eye, it’s a pathway to enjoyment that makes the journey as fun as the destination. One time, though, a friend of mine was cruising through the library, and on a mission. He was looking for a particular book, and nothing else would do. He visited the right floor, the right section and the right shelf. The system said it was available, but it wasn’t. Even the help of a kind librarian was to no avail. A recent retail experience again reminded him of that misshelved book. Amazon knows a thing or two about books. It started as an online bookstore, and eventually diversified to sell nearly anything that can have a price tag placed on it. It is the largest Internet based company in the United States, and it’s often our first stop shopping destination. We love Amazon, and it loves us back. With regular enticements like free shipping, discounts, Black Friday sales, and rewards programs, it’s everything we’d want in a shopping experience, even if we can’t touch and smell the item first. Then, several years ago it introduced Amazon Mom. For years, dads have been unfairly mislabeled “Mr. Mom” – a name they find both offensive and erroneous (would anyone dare call a working mother, “Mrs. Dad”?) – so it’s easy to make a sophisticated deduction about what Amazon Mom might entail. So let’s get this straight: a dad can join a mom program? The word mom has become a generic term for parent, like Kleenex is for facial tissues? And then dads must stop to think: realistically – as a dad – is Amazon Mom speaking to you? Does this program’s name suggest something that you would want to browse? Would you walk into a “mom” retailer, or down a “mom” aisle in a bricks-and-mortar store? Also recently, we had a pleasant 140-character conversation with the friendly folks at 4moms, a baby robotics company founded in March 2006 which makes high-tech baby gear. 4moms enlightened us that its company name is derived from an initial focus group held that consisted of four mothers. Cute and unique, indeed, but in a baby world where businesses purposely leave dads out of the parenting mix, it’s a saying that’s well-worn. Had the name been 3moms or 5moms, we would have never taken issue with anything. But imagine that the wildly-successful burger-maker franchise Five Guys had been named 4Guys – that means something else entirely, doesn’t it? We’d all perceive them differently, and wouldn’t women be deservedly up in arms? We’re sure the desire of 4moms to match true company history with the play-on-words was too good for them to pass up, but you know who gets passed up in the process? Dads are parents too, and it’s time businesses start listening to fathers everywhere. Judging by its products alone, 4moms seems to have a bright future ahead. And with a financial backing like no other in cyberspace, Amazon will probably carry on for a long time, that is, unless the recent uproar forces at least an overdue name change. But like that lost library book, if my friend doesn’t know where these companies are or doesn’t notice them because they’re not speaking to him (he’s even a dad), then how can he find them? They must not care about dads as customers, right? If a product is not categorized and shelved properly like that book, do consumers stand a chance at ever finding it, enjoying it, or even using it? If these companies really cared, perhaps they could start marketing their products to its true customers. As in, all of them. 4moms is a robotics company founded in March 2006 which makes high-tech baby gear. Among several other items, it offers for example, the world’s only power-folding stroller. If that isn’t cool enough you should check out its infant tub which fits in most single and double basin sinks, where a side drain allows dirty water to drain out as fresh water flows in. Or dig the infant seat and its five unique motions that mimic the natural movements parents make to comfort a baby. This gadgetry is only for moms, right? Recently, we had a pleasant 140-character conversation with the friendly folks at 4moms, who enlightened us that its company name merely comes from an initial focus group held that consisted of four mothers. Had the name been 3moms or 5moms, we never would have taken issue with anything. Imagine that the wildly-successful burger-maker franchise Five Guys had been named 4Guys – that means something else entirely, doesn’t it? We’d all perceive them differently, and wouldn’t women be deservedly up in arms? Oddly enough, the company was founded by two dads. 4moms assured us that they “definitely know” that dads count too, but there’s little proof of that by way of the website and anything on the product proving otherwise. If anything, it’s just the opposite, with a 4moms logo adorned vividly. Sure, they could add a special section honoring dads or put some extra wording on their website somewhere, but that would do little to market to the in-store shopper. What would a company called 4dads be about? We have a few ideas, but we doubt baby products is one of them, and that’s our point. Judging by its products alone, 4moms seems to have a bright future ahead, and eight years in the books for a company like 4moms is kind of like eight months in baby years. 4moms is still very young. Which is why we think it’s plenty early and not too late to consider a name revision: how about 4moms+4dads? Such a name would pay homage to its founders, Thorne & Daley, who must deep down care a thing or two about dads. And speaking of care, if 4moms really cares – as its charity’s name suggests – how about starting with its customers?